"Makes 10-15 servings. This recipe can be adjusted according to your taste preferences, so you can leave out undesirable ingredients or add others that appeal to you (like mushrooms). 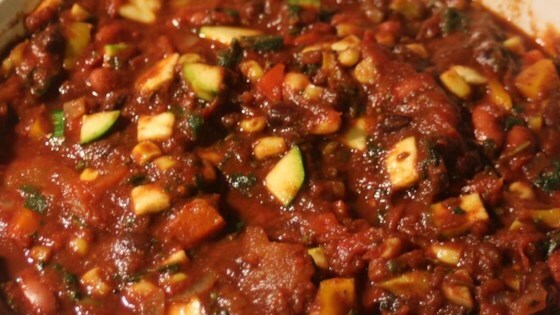 I add ingredients just to bulk up the heartiness and color palate of the chili, but feel free to just use a few green peppers or same-colored zucchinis as you desire. By the end, you just want everything to be hearty, moist, and flavored -- mess around with it as you go! I would say to serve it with shredded cheese and corn chips, but then it's no longer 'vegan.' : )"
Heat olive oil in a large skillet over medium heat, and cook the green, red, and yellow bell peppers, onions, and garlic until the onions start to brown, 8 to 10 minutes. Place the mixture into a slow cooker. Stir in spinach, corn, zucchini, yellow squash, chili powder, cumin, oregano, parsley, salt, black pepper, tomatoes, black beans, garbanzo beans, kidney beans, and tomato paste until thoroughly mixed. Pour the tomato sauce and vegetable broth over the ingredients. Set the cooker on Low, and cook until all vegetables are tender, 4 to 5 hours. Check seasoning; if chili is too thick, add more tomato sauce and vegetable broth to desired thickness. Cook an additional 1 to 2 hours to blend the flavors. Pumpkin puree and pumpkin pie spice do wonders for this beef and bean chili. This is great - was easy to make and people loved it! I made it for a group and had a number of people request the recipe.